You are here: Home / Cleaning / When should I throw out make up and cosmetics? When was the last time you went through your make up bag or the old random items in your vanity? Did you know that old make up and cosmetics can cause skin and eye infections and general irritation. There is currently no requirement for cosmetics to be labeled with an expiry or best before date so you’ll need to keep track of when you bought what. Some products do contain a small triangle with a number which indicates how long before you should throw it out after opening. To help remember when things need replacing you could set a reminder in your phone or write the used by date on them with a permanent marker. Here is a guide to how long you should keep various make up and cosmetic products before throwing them out. 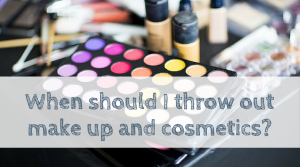 Do you regularly dispose of make up and cosmetics?